Nursing home workers in New Brunswick have a victory in their battle after a judge ruled in favour of the CUPE union. “The only comment I would make, is that you can see the big smile on my face,” said CUPE N.B. president Danny Légère. Judge Paulette Garnett of Queen’s Bench rescinded an earlier 10-day stay after finding an issue with the constitutionality of both the original stay and a requested, permanent stay. The court injunction New Brunswick obtained on March 9 prevented long-term care workers from going on strike. Justice Garnett said the province failed to notify CUPE prior to ordering the injunction, which they were required to do. She also ordered the association and government to pay the union $2500 each. Following Judge Garnett’s ruling in favour of CUPE on all motions, the province and nursing home association applied for an appeal. “On a go-forward basis, we look forward to getting back to the bargaining table and finding a resolution,” said Hall. The appeal was still being heard in court as of 7 p.m. on Monday. 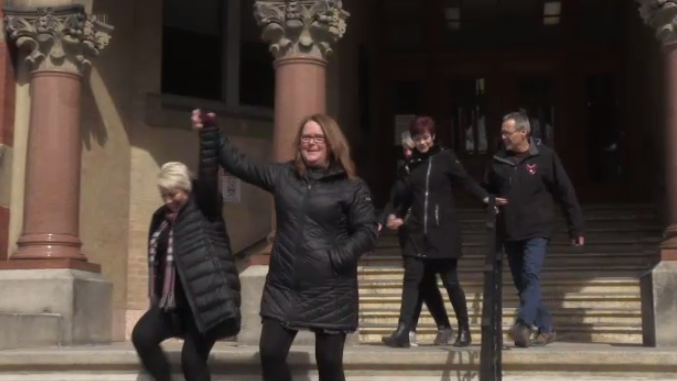 CUPE union members celebrate as judge rules in favour of their battle with the New Brunswick government.